Earth’s climate has been remarkably stable since before the dawn of civilization. This stability is now at risk. Stepping in to the COP23 climate talks in Bonn, Germany, is like wandering through an alternative reality. At no point in these vast cavernous rooms are you confronted with the sheer urgency or the scale of transformation required to reduce the risk of a fossil-fueled catastrophe. Meanwhile, back on Earth the Global Carbon Project announced on Monday that greenhouse gas emissions from fossil fuels are expected to grow approximately 2% this year. This comes as startling news after three years of virtually no growth in global emissions. Two years after nations signed the historic Paris Agreement, carbon dioxide in the atmosphere is rising faster than expected and the international community lacks essential leadership to tackle this crisis. The US, the world’s largest economy and second largest emitter, is rolling back on regulations that will curb emissions and save lives by reducing air pollution. China’s emissions, by far the world’s largest, are expected to rise 3.5%, despite heavy investment in clean energy. These trends are concerning. But what is most alarming is that we continue down this treacherous path despite having the scientific and technological tools needed to transform humanity to a healthy and prosperous society. How do we bridge the growing chasm between the geopolitical world and the geophysical world, commonly known as Earth? To put the current negotiations in context, we have just published a 10-point statement to walk through the narrative of this latest chapter in human history. Evidence from many lines of inquiry shows Earth has entered a new geologic epoch —called the Anthropocene. The rate of change in the Earth's system is accelerating as a result of our impact on the planet’s biology, chemistry, and physics. Earth’s climate has been remarkably stable since before the dawn of civilization. This stability is at risk. 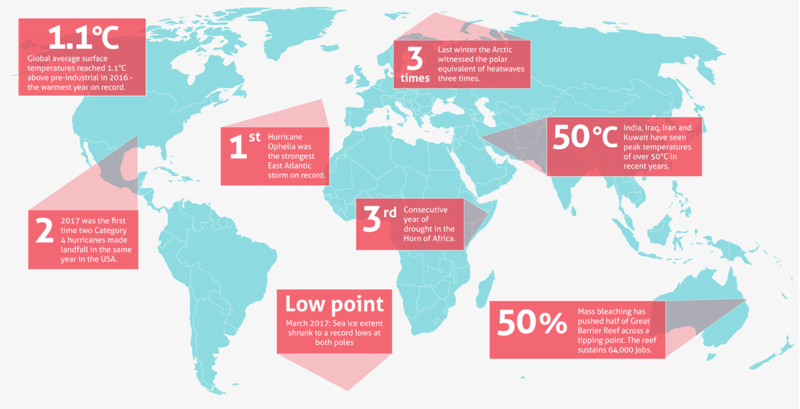 The worry is that Earth is approaching critical “tipping points”. By crossing these thresholds, the planet may see abrupt, and possibly irreversible, shifts in the workings of the Amazon rainforest, ocean currents and El Nino. 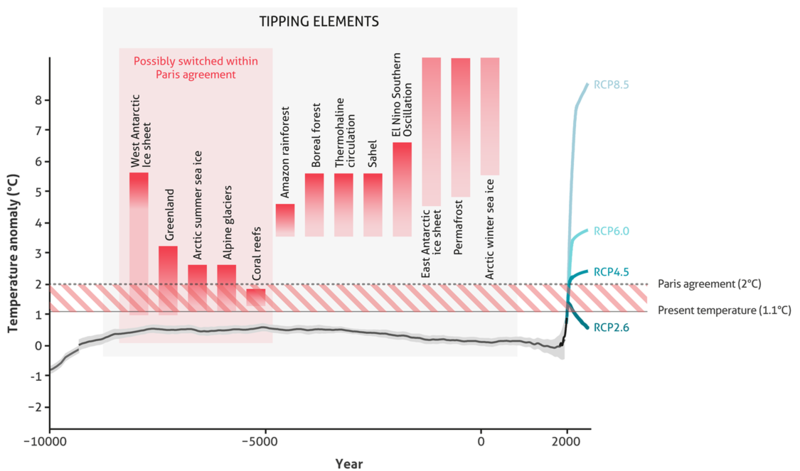 Even within the 2°C upper limit mandated in the 2015 United Nations Paris Agreement, Arctic summer sea-ice could disappear, parts of the Greenland and West Antarctic ice sheets could collapse, and most coral reefs could vanish. The record-breaking 2017 Atlantic hurricane season provides a glimpse at the increased risks of extreme weather events that the planet may experience in the future. These events include severe flooding, heat waves and droughts. Changes are occurring quickly in the ocean, with accelerating sea-level rise and ocean acidification. The economic costs of climate change are already being felt, and the some of the world’s poorest nations are bearing the heaviest burden. Climate change will have a profound impact on human health by placing new pressures on the food and water security in nations around the world. It is also likely to exacerbate migration, civil unrest and even conflict. In 2015, more than 19 million people globally were displaced by natural disasters and extreme weather events, and climate change will likely cause that number to grow. The world needs to act fast: if humans continue to emit greenhouse gases at current rates, the remaining carbon budget to reduce risk of exceeding the 2°C target will be exhausted in around 20 years. Emissions should peak by 2020 and approach zero by around 2050 if the world is serious about reducing risk. As a simple rule of thumb, this means halving global emissions every decade, which can act as a golden rule. This golden rule is a road-map to prosperity. A fossil-fuel free society is economically attractive: renewable energy sources increasingly compete with fossil fuels, even when these are priced at historic lows. Moreover, the estimated costs of inaction range from 2-10% of GDP by 2100 by some estimates, to a final invoice equivalent to a 23% collapse in global productivity. And there is a simple shortcut to the roadmap to global prosperity. Do you want to know the secret? Put a price on carbon and remove perverse subsidies for fossil fuels which the International Monetary Fund estimates cost the global economy a staggering $5 trillion a year. The extreme events that beset Puerto Rico, Portugal, Houston and Bangladesh in recent months show that even if the world meets the Paris Agreement targets, communities across the globe will still need to build resilience and adapt to the changes already under way. The world can afford to become free of fossil fuels. It cannot afford to fail. We have the tools to do the job. All we need is the political will and the right road-map.